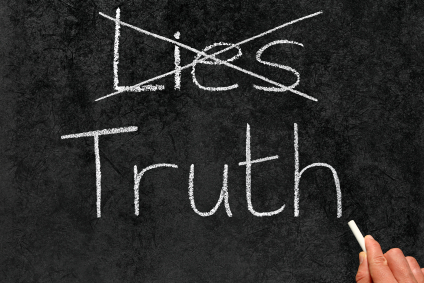 A District Deeds Exclusive – 2 BIG LIES EXPOSED!!! San Diego Unified Superintendent Marten/Board of Education BIG Budget Con Job Continues Tonight!!! San Diego Unified School District Superintendent Cindy Marten and Trustees Richard Barrera, Kevin Beiser, John Lee Evans, Mike McQuary and Sharon Whitehurst-Payne have repeatedly proven they all lie to SDUSD Parents, Students, Employees, Communities and Taxpayers. At the Board Meeting tonight, that legacy of lies and deception will reach a new heights as the Superintendent and Trustee Con Artists FULLY responsible for the 2017, 124 Million Dollar Financial Management Disaster attempt to convince SDUSD Stakeholders of 2 key lies. The $124 million dollar deficit was due to a “structural deficit” caused by others outside of the SDUSD and not by financial mismanagement of Supt. Marten and Board of Education. There has been NO “structural deficit” since 2012. The $124 million dollar deficit was due to a COMPLETE lack of Governance and Accountability by the SDUSD Board of Education over a Superintendent Cindy Marten spending spree that ballooned expenses and created a 124 million dollar deficit today…a TRUE financial mismanagement SCANDAL! “The shortfall is due to a variety of factors, including rising pension costs, labor market pressures and less than expected state support,” Marten said. A J-Curve Chart from a recent Voice of San Diego article by Ashley McGlone clearly proves that Marten is lying. Following the GOLD line, you can see that Revenues seriously declined from 2007 – 2012 that FORCED the District to reduce Expenses (the Maroon line) to balance the budget. The lowering of expenses at that time included layoffs, This is essentially the definition of a “structural deficit” in Government Organizations…lower “Revenue” from taxes due to a recession and forced to make cuts on the lowered tax revenue “structure”. The compete OPPOSITE occurred when Marten took office in 2013. Beginning in 2014 and continuing through the present, the Revenue (GOLD line) shows a revenue increase SPIKE upwards…MUCH more Revenue coming in. The Expense line (Maroon) shows an even more dramatic SPIKE upwards, representing spending outpacing the revenue increase. In a Government organization, when revenues from a growing economy increase, unless there is a catastrophic event (earthquake, hurricane etc) that grows expenses, there is absolutely NO STRUCTURAL DEFICIT. 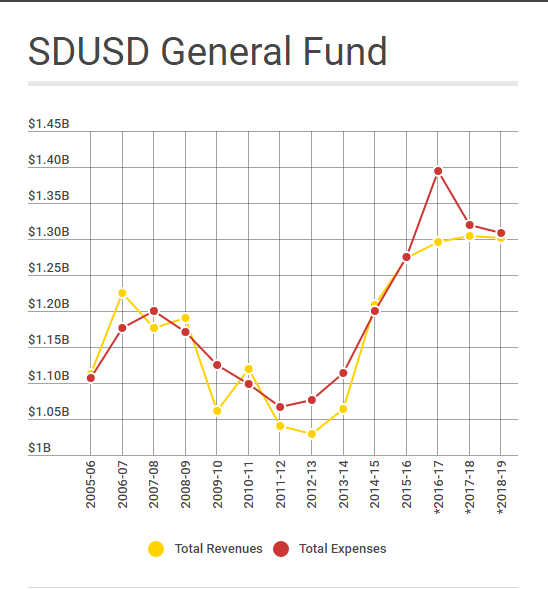 For the SDUSD after 2013, any deficit created with a massive revenue increase is caused by NOT managing (or not knowing how to manage) the budget with NO governance by the Board of Education that was elected to do exactly that. The most recent example of this dereliction of duty by the Board is a few weeks when Marten gave the Board a list of priorities for budget reduction. The JOB of the Board is to identify financial priorities and then have the superintendent carry it out operationally. In past years there was long public debates at Board Meetings among trustees as to what layoffs should occur before the 1st reading of the budget. Typical of this inept Superintendent and this ineffective Board. Clearly an abdication of authority by the Trustees, disgraceful financial management by the Superintendent and NO accountability by anyone in SDUSD leadership creating a financial scandal to the tune of 124 Million Dollars. SDUSD layoff estimates by the Press, Supt Marten and the Board Trustees range from 400 to 850 total layoffs and only a fraction of the layoffs will become reality. .
District Deeds estimates that closer to 1,800 SDUSD employees have been identified to lose their jobs due to the financial mismanagement of Superintendent Marten and Trustees Barrera, Beiser, Evans, McQuary and Payne. The Superintendent and Trustees have repeatedly lied to SDUSD Stakeholders and the Press about the quantity and impact of layoffs and other cuts to minimize their complicity in this financial scandal. Fox 5 San Diego followed up with an 833 layoff number and the San Diego Union Tribune pitched in with an 850 layoff guesstimate. District Deeds painstakingly reviewed 8 spreadsheets provided within the Agenda item H1 for tonight’s Board of Education meeting. The TOTAL layoffs is NOT “400 or 500 positions” like Trustee John Lee said…a basic lie. Or 833 layoffs like Fox 5 San Diego was lied to by the SDUSD Propaganda Department. Or even the 850 layoffs like the San Diego Union Tribune was lied to by the SDUSD Propaganda Department. Superintendent Cindy Marten and the Board of Education need to be held accountable for this Grand Total of MISERY caused by their total dereliction of duty. How many more hard-working employees and their families will have to worry and suffer because of this scandal? This MUST come to and end. The District MUST be investigated by the United States Department of Education, the California Department of Education and the San Diego County Board of Education for financial mismanagement. Supt. Cindy Marten MUST be fired. Remember that as they LIE TO YOU AGAIN at the Board Meeting tonight. Ms. Marten was on a news show explaining the debt was from previous years before she was superintendent. I guess the “no excuses” part of her catch phrase no longer applies! What a mess they’ve made due to mismanagement. Governor Brown warned Districts there would be decreased funds and our District took that as a signal to give pay raises. Brilliant! Which news show was she spreading her lies?